There are 55 Oratories around the world, most of them in western Europe. This number is likely to increase in the next few years with Oratories in formation in Manchester, York, San Francisco, Jamaica and Brisbane. The notion of the Oratory was invented by St Philip Neri in the middle of the sixteenth century with the creation of the Congregation of the Oratory in Rome. During the next 100 years, further Oratories were opened, parti9cularly in Italy, France and Germany. The first Oratory to be opened in England was by John Henry Newman who founded the Birmingham Oratory in 1847. A few years later Frederick Faber founded what eventually became the Brompton Oratory in London. There was not to be another Oratory founded in England until about 20 years ago when some priests left the Birmingham Oratory to form one in Oxford. More recently, there have been efforts to establish an Oratory in Manchester. Initially, it was to be formed around the Holy Name Church, but has now settled at St Chad's Church. This community is likely to be declared an Oratory soon. The latest development has been in York, where priests from the Oxford Oratory have made the first moves to establish an Oratory there. Priests of the Congregation of Oratorians live in community, but differ from monks in that they take no special vows. There will be a Latin Mass at 6pm in St Wilfrid's Church in York on Tuesday 25th March, the feast of the Annunciation. On the same day at 7.pm, a meeting has been called to discuss the future organisation of the various churches in York, in the light of a declining number of priests. This will take place at 7.pm in the hall of St Aelred's Church, Tang Hall. It is proposed that York should constitute a single "Pastoral Area", which means that some activities should be organised on a York wide basis. Put another way, there should be more cooperation between parishes. Maybe some flesh will be added to this proposal at the meeting. It could be useful to have a decent representation of supporters of the Latin Mass at this meeting. Additional Mass This Week. Thursday 27th March. As well as the EF Masses already taking place at St. Wilfrid's this week for the Solemnity of the Annunciation tomorrow at 6pm (Low Mass) and the Pilgrimage mass in honour of St. Margaret Clitherow and the York Martyrs on Saturday at 1.30pm (Solemn High Mass), Fr. P. Mulholland will be celebrating mass in the extraordinary form at St Francis of Assisi, 45 Wembley Park Avenue Hull HU8 0ND on Thursday evening, 27th March 2014 at 7pm. It will be a dialogue mass and is the feast day of St. John Damascene. All are welcome. This is a reminder that the pilgrimage in honour of St Margaret Clitherow and the Martyrs of York will take place at St Wilfrid's Church in York NEXT Saturday, 29th March. The Solemn Mass will be at 1.30pm, with the procession following at 3.15pm. Benediction will be at about 4pm. Music by the Rudgate Singers. I was very pleased to read this morning that Bishop Malcolm McMahon OP, currently Bishop of Nottingham, is to be the new Archbishop of Liverpool. Bishop McMahon is one of very of the very few bishops in England and Wales who is willing and able to celebrate Mass in the older form. He celebrated the principal Mass at last years training conference at Ratcliffe College, and this was greatly appreciated by all who attended, priests and laity alike. Back in 2008, he was the celebrant at Solemn Vespers at an earlier Priests' Training Conference at Merton College in Oxford. He was also the principal after dinner speaker, and his oration went down exceptionally well on that occasion. I am sure that he will make an excellent Archbishop of Liverpool. This is not the only recent episcopal appointment that should give cheer to those who love good liturgy. A few days ago, it was announced that Fr Robert Byrne (Cong Orat) will be taking up the post of Auxiliary Bishop in the Archdiocese of Birmingham. Fr Byrne is a member of the Oxford Oratory, and it almost goes without saying that this must be a good thing. Archbishop Denis Hart of Melbourne has erected a personal parish for the traditional Mass community in his archdiocese. It is based in Caulfield, which is a suburb of Melbourne. The parish will formally be designated the Parish of Blessed John Henry Newman and Fr Tattersall will be appointed Parish Priest. The church has hitherto been under the patronage of St Aloysius and is a fine building in the neo-gothic style. Two Latin Masses are offered each Sunday. In this regard, Australia is ahead of England, as no personal parish for the traditional rites has been erected here. The nearest that we have is a shrine church in New Brighton, but this is not a parish. The website of the conference of the bishops of France gives the numbers of priestly ordinations in 2013 for each diocese. There are 108 dioceses in France. During the year, there were 92 ordinations for diocesan priests, which is less than one per diocese. The top performing dioceses were:- Frejus-Toulon 10, Verseilles 8, Paris 6, Gap 5, Grenobles-Vienne 4, Avignon 3, Lille 3, Chartres 3, Autan 2, Bayonne 2, Bordeaux 2, Dijon 2, Le Mans 2, Le Puy 2, Orleans 2. There were 21 dioceses with a single ordination, leaving 72 dioceses without any at all. There were also 38 ordinations for priests belonging to religious orders. I am not sure whether this includes the traditional orders or not. The striking feature is how much the top performing dioceses are ahead of run of the mill. Needless to say, Frejus-Toulon has a bishop who is well disposed to the traditional Mass. England and Wales performs rather better than France with an average of just over one ordination per diocese. Scotland, regrettably is doing less well. Supporters of the older form of the Mass in the Middlesbrough Diocese have reason to be thankful to Bishop Drainey. Soon after Bishop Drainey was appointed as Bishop of Middlesbrough, I had a meeting with him, and it immediately became obvious that he acknowledged the need to improve the provision of usus antiquior Masses in the diocese. He understood that this would require additional priests able and willing to celebrate Mass in that form, and promptly set about the task of finding suitable priests. One priest responded to his request, and this was Fr Stephen Maughan, who became the regular celebrant of the Sunday Masses in York. Later, the shortage of priests in the diocese became so acute that Fr Maughan was required elsewhere, but he continued to offer monthly Masses in York, and Bishop Drainey arranged for Fr James Callaghan OSB to offer Mass on another Sunday each Month. By good fortune, Fr David Smith, who serves as an army chaplain, was able to offer Mass on the remaining Sundays, although this was an arrangement which would have had to come to an end when Fr Smith was posted elsewhere. A more permanent solution to the availability of the traditional Mass in York has now been found, and again we can thank Bishop Drainey for this. He has welcomed Oratorians into the diocese, and part of his reason for doing this is to ensure the continued provision of Mass in the older form. Regrettably, there are other dioceses where those attached to the traditional Mass are not treated as well by their bishops as we have been in Middlesbrough. An example is the Diocese of Fort Worth in the USA, where the students of More Fisher College have been denied the right given to them by Pope Benedict XVI in his motu proprio, Summorum Pontificum. The letter that a student of that college has received from his bishop can be seen on Rorate Coeli and other blogs. The annual pilgrimage organised by the Latin Mass Society in honour of St Martgaret Clitherow and the Martyrs of York will take place on Saturday 29th March in York. 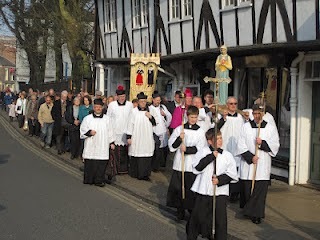 Here is a picture of the pilgrimage of 2012 which was attended by Bishop Drainey. The pilgrimage will start with a Solemn Mass at 1.30pm in the church of St Wilfrid and will be followed at 3.15pm by a procession through the city streets, passing through The Shambles and over Ouse Bridge, before returning to St Wilfrid's Church for Benediction at about 4pm. This year, all of the 51 martyrs who were executed in York are being included. There will be a Mass with distribution of Ashes at St Wilfrid's Church in York at 6pm on Wednesday. It will be a Missa Cantata.